The Kangovou Kids Dishware Set features five pieces of kids dishware that are meant to last you and your kids a lifetime. 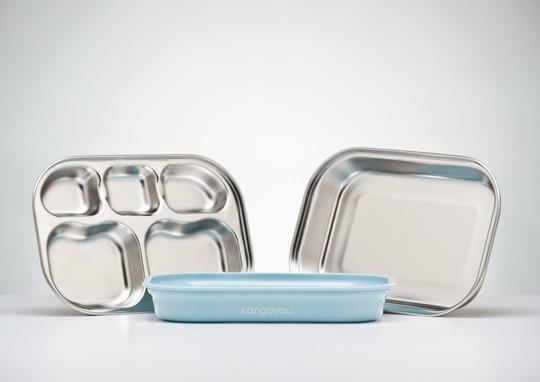 Our Kids Dishware Set makes lunch organization easy and ensures that your kids are eating from dishware that is completely free of contaminants, while keeping their food fresh.The Kids Dishware Set is made with insulated, rust proof stainless steel that is BPA and lead free. Not only does the kids dishware set keep your kids food separated and fresh, but it also makes your life easier when it needs to be cleaned, because it is 100% dishwasher safe! 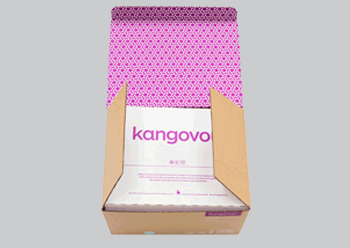 All Kangovou products are 100% BPA-free, lead-free, PVC-free, phthalate-free, and Melamine-free. These harmful chemicals are found in most hard plastics that make-up the majority of popular, plastic food-storage containers. These chemicals can deeply affect your mood and health, leaching into your food and causing mood swings, weight gain, hormone fluctuation, heart disease, and other health complications. Recently, the Center for Disease Control (CDC) determined that 93% of children, and 95% of adults, have been negatively affected by these chemicals at one point in their lives. At Kangovou, we ensure safe products for you and your family. Our contaminant-free dishware protects your children’s health. 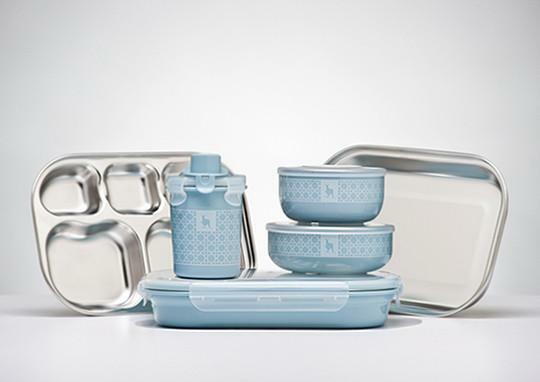 Kangovou Dishware is also eco-friendly, and built to last with insulated stainless-steel, safe plastic, and paired with sturdy snap-on lids. 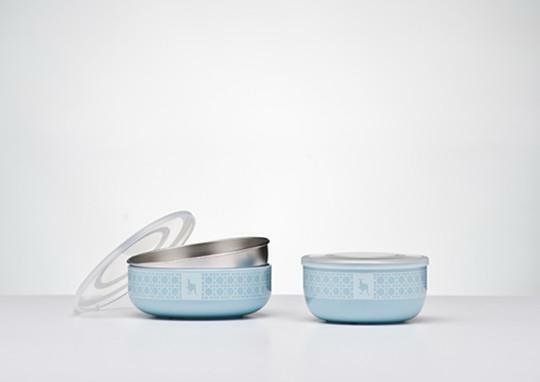 Kangovou Dishware is top-shelf dishwasher safe, making cleaning easy. 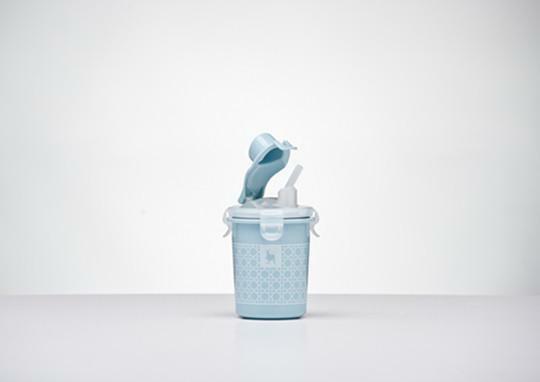 Kangovou Dishwares makes your life easier and healthier, protecting your food from harmful chemicals and providing an environmentally-friendly alternative to standard food-containers. It was nearly impossible to find an attractive multipiece stainless steel feeding set. This product certainly fits the bill. I like that the metal portions have plastic coverings that are easy to get on and off. Makes cleaning it pretty easy. The bowls are a good depth and can hold a good portion of food. 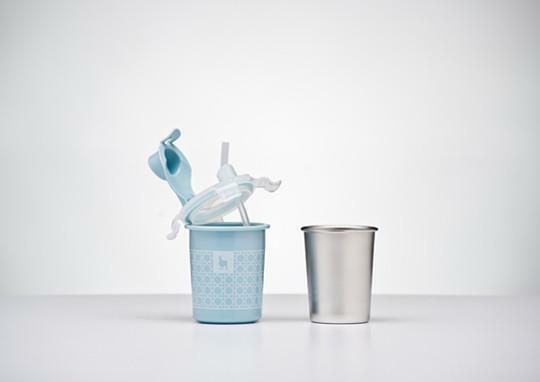 Admittedly I am not a fan of the sippy cup but am hoping to take out the stainless insert and just use it as a normal cup. The ‘iced mint’ color is really pretty and makes the dishes a bit more fun. This set is a bit pricey but I don’t plan on buying/needing any more kid friendly serving dishes for a long time. The dishes are excellent. The cup would be great except that the hard plastic clips that secure the lid to the cup break immediately. The cup is heavier when filled and if the toddler knocks it over on a hard surface, the plastic clips crack and break. The cup has 4 clips on the lid and if they aren’t all working, the cup seal does not keep the cup from leaking. It’s good for my son. It can be separate with the base and cover.The color is elegant and bright. This was purchased with the BPA free products being not so healthy after all, in mind. So I ordered a set for my son and another complete set for my best friends family. We both like the set and find the lids are very useful as well. We use the divided tray with lid for my almost 4 year old sons lunchbox at preschool. He has no problem opening it and he likes the colors as well. We use the bowls for soup and for snacks and the non-divided tray gets used as his plate for home. He was really excited about the cup but after having read other reviews decided to buy another stainless steel cup just in case this one broke. And it did. And so did my friends cup as well. The issue for us was the fasteners that attach the lid to the cup. One broke off. The issue with my friends cup was the same but also mold. It’s not easy to wash the parts inside. We are now using the cup sans lid and it’s fine because my son is almost 4 and has been drinking out of a regular cup without issue for some time now. But my friend has an almost 2 year old that still needs a straw or sippy and this was disappointing. Especially with the amount of money this whole set was. It feels like a bit of a waste of money for a cup that only lasts literally ONE week. Anyway, the rest of the set is awesome, and if the cup were better designed than they would get 5 stars. But for now, 4 stars. I’ll contact the company and see their response. If they are helpful (or not) then I’ll change my rating. Two boys like it very much.